Ensure your suppliers meet your specifications with the latest weighing and measuring solutions. 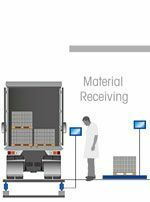 Verify the amount of incoming goods quickly and accurately with vehicle, floor and bench scales. Test the material with moisture analyzers and other analytical instruments for quality and reliability. Quality control, failure analysis and new product development require reliable and powerful analytical instruments. Material characterization by thermal analysis is a key application. Karl Fischer titrators determine water contents down to 1ppm. Exact analyses are crucial for longterm market success. Smart weighing and counting solutions keep track of stock movements, ensure flawless goods storage and help avoid out-of-stock situations through direct integration into ERP systems. Mobile counting scales facilitate and speed up commissioning. Process automation and fast user guidance are essential to increase production efficiency and consistency. Batching scales mix raw materials automatically, while counting scales and recipe-weighing solutions guide the operator quickly and reliably through each step of the working process. Process reliability is indispensable to maintain high product quality and to ensure customer satisfaction. Damaged or incomplete products or cavities in castings are discovered through manual over/under checkweighing or integrated high-precision weighing modules in production machines. Make sure you pack the correct amount of parts and ensure correct packaging and labeling. Static or dynamic checkweighers guarantee that no product leaves the factory with missing parts. Vision inspection verifies packaging and labeling and ensures brand integrity. Prior to shipping, orders must be complete, on time and properly documented for tracking and tracing. METTLER TOLEDO weighing and labeling solutions make sure you meet all regulations and fulfill your customers’ requirements. Please contact us to find the right solution, to receive a quotation or to place an order.